We represent you a new device of the series of monochrome "Epson Print Factory". Epson L210 with original CISS is a printer, scanner and copier in one case. It's a perfect device for home as well as for office, which will provide you with quality and economical printing. Users will appreciate it advantages for sure. This printer has four-color system of printing. The operation speed is rather high. It is up to14 and 28 pages per minute in monochrome and color modes respectively. The printing resolution is 5760 × 1440 dpi. Due to such great characteristics it is perfect even in printing of small elements. The quality level of scanning is also very high. It will be perfect assistant in any office. The average price of the device is about $ 220. To buy Epson L210 is to spend money on a quality printing device, which will save your budget in future. 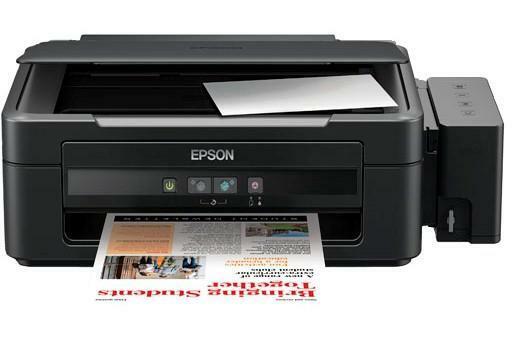 MFP Epson L210 has all the required functions. By buying it, you will get scanner, copier and quality printer in one unit. Moreover, it has a rather compact size, so it will fit any interior and will not take a lot of working space, because you have three devices in one case. You should pay attention to Epson L550, which has a fax function. Epson L200, price which is rather low, will surprise any user with its wide range of functions. Besides all the merits, it also has a stylish design, so it will fit any up-to-date interior. Due to its compact dimensions it can be located even on a small office desk. The design of the device is very handy. CISS is located on the right side panel of the printer. On its front panel the operation indicator and power and reset buttons are located. You can find CD with drivers, power cable, instruction for CISS, documentation and warranty card in the delivery set of the device. If you need to print a lot, you should consider such model as Epson L355. It will be perfect if you are looking for a good printer with perfect quality-price ratio. Due to its advantages, L210 will be a real competitor for similar models of other brands. Thus, you have got acquainted with a quality printer, which will provide you with all the necessary functions at a reasonable price.